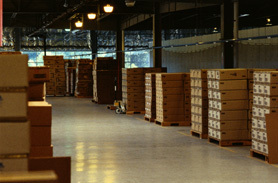 A unique part of our company is that we have significant warehousing capabilities that we can make available for high volume programs. This can produce significant logistical and economic advantages to you as a customer when you consider the costs involved in having to constantly move product in and out of outside warehouses to the extent there are fluctuations in product sales or unexpected problems in the supply chain. We can act as a buffer for those demand fluctuations or provide regular ongoing space to simply your logistical patterns. Our space is clean and temperature controlled and is staffed with our own employee operators. We have well conceived operating procedures that our operators are well trained on to make sure your products are not mishandled in any way. One of our accounts uses nearly 2,000 pallets spaces in supporting their program. We estimate this saves them tens of thousands of dollars per month in being able to periodically stage product at our place rather than push it out to temporary storage facilities.